Be the first to share your favorite memory, photo or story of Marianne . This memorial page is dedicated for family, friends and future generations to celebrate the life of their loved one. 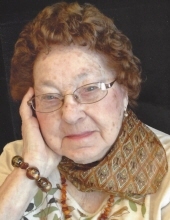 Garrison—Marianne Buhr, 96, died Wednesday, March 27, 2019 at the Vinton Lutheran Home. Funeral services will be 10:30 a.m. Saturday, March 30, 2019 at St. Mark Lutheran Church in Garrison with Rev. Mark Leckband officiating. Visitation will be 4 to 7 p.m. Friday, March 29 at Van Steenhuyse-Russell Funeral Home in Vinton and for an hour before services at the church on Saturday. Burial will be in the Keystone Cemetery following lunch at the church. Marianne was born May 16, 1922 in Neumuenster, Germany, to Juergen and Friederike Harder. Her parents moved to Iowa when she was 2 years old. She grew up and attended school in Keystone. On September 24, 1941 she married Heinz Buhr at St. John Lutheran Church in Keystone. The couple farmed in the Keystone and Garrison area, retiring in 1979 and moving to Vinton in 1985. Marianne was a member of St. Mark Lutheran Church in Garrison where she was active in Tabitha Society and as a Sunday school teacher. She enjoyed card club and she especially enjoyed her grandchildren. She is survived by her children, John (Mary) Buhr, Garrison, Marlene (Michael) Grimm, Garrison, and Doreen (Daryl) Forbes, IL; ten grandchildren, Chad (Lana) Forbes, Amy( Josh) Dean, Jason (Heidi) Grimm, Billy Grimm, Jessica (Tyler) Henkle, Susie (Alan) Henkle, Stephanie (Mike) Vant Sant, Stacie Buhr, Kent Klingman and Rhonda (Craig) Fry; fourteen great grandchildren, Kierstin Dean, Nolan Forbes, Emerson Forbes, Logan (Matt) Walston, Kristen Halstead, Kaitlyn Halstead, Lucas Birker, Jaden Grimm, Bryson Grimm, Kyle (Emily) Henkle, Eric Henkle, Ben Buhr, Kenny Vant Sant, Carter Vant Sant, and one great great granddaughter, Ava Walston. In lieu of flowers, the family suggests memorials be directed to St Mark Lutheran Church. Van Steenhuyse-Russell Funeral Home is caring for Marianne and her family. Condolences may be left at www.vsrfh.com. To send flowers or a remembrance gift to the family of Marianne Buhr, please visit our Tribute Store. and for an hour before service at the church on Saturday. with Rev. Mark Leckband officiating. 71st St. and 14th Ave.
"Email Address" would like to share the life celebration of Marianne Buhr. Click on the "link" to go to share a favorite memory or leave a condolence message for the family.